Marble Art Palace is a treasure trove, with statues, sculptures, garden furniture and beautifully-carved decorative items. In particular, we love their Buddha statues that will lend tranquillity to your home. The store has every conceivable design and size. Handcrafted and affordable, like this one, we recommend upping the zen quotient in your home, pronto! Whether you’re looking to add signature elements and pieces to your home or office, Baaroq’s lifestyle and home decor products are a good bet. In particular, we love Baaroq’s eclectic collection of doorknobs. Ranging from an edgy skull to a pretty shell design, they have it all. Head on here for a wide variety of door accessories and you’ll be spoiled for choice. Opening the door was never this much fun! This brand specialises in stainless steel pieces; in fact the name itself translates to ‘art of stainless steel’. Their diverse range is amazing, bringing to our notice just how beautifully furniture can be reinvented with steel. They have an extensive collection of cutlery, tea cups and pots, all characterised by contemporary designs and modernity. Their products are handpicked from all over the world: Italy, Sri Lanka, the United Kingdom, Paris, Malaysia and even our very own Dilli. 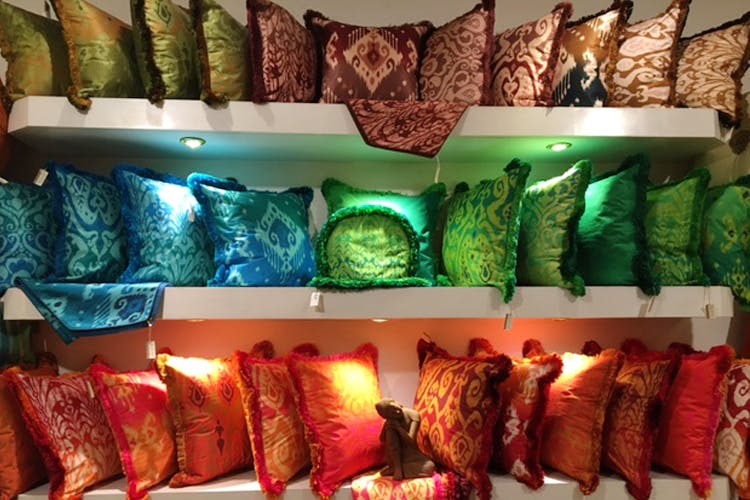 Every piece at Fennel has a unique energy and will add a dose of vibrancy to your house. In particular, we love their vase collection that is reasonably priced but also super glam. The luxury house believes in one-of-a-kind furniture pieces that are quirky and edgy. This is coupled with sophistication and a unique vision. They have a lovely collection of candelabras that are truly understated but, we believe, are must-haves. This well-known decor brand has a huge selection of pretty pieces that are inspired by Indian handicrafts and traditional design, but with a twist. Expect lots of ikat work and gorgeous jewel colours. Their pillows are a hot favourite and sell out quite fast, so pick up a few and get comfy!